After the International Break, the Premier League Returns! Home > Around Online Poker > Can Liverpool, Chelsea and Watford Make it Five Wins from Five? 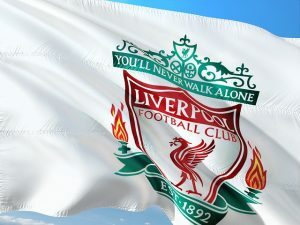 After a break last weekend for a number of international games in the UEFA Nations League and friendly matches, the Premier League returns this coming weekend with some massive games including the three teams with a 100% winning record, Liverpool, Chelsea and Watford, all putting them on the line in a trio of big games. Before we take a look ahead to the big games this weekend, let’s recap how results went in Matchday 4 and how that affected the League table, before we then take a look at out best bets for the weekend. Remember too, if you want to enjoy a football bet, new customers can enjoy a bet365 Sport Welcome bonus when they sign up. 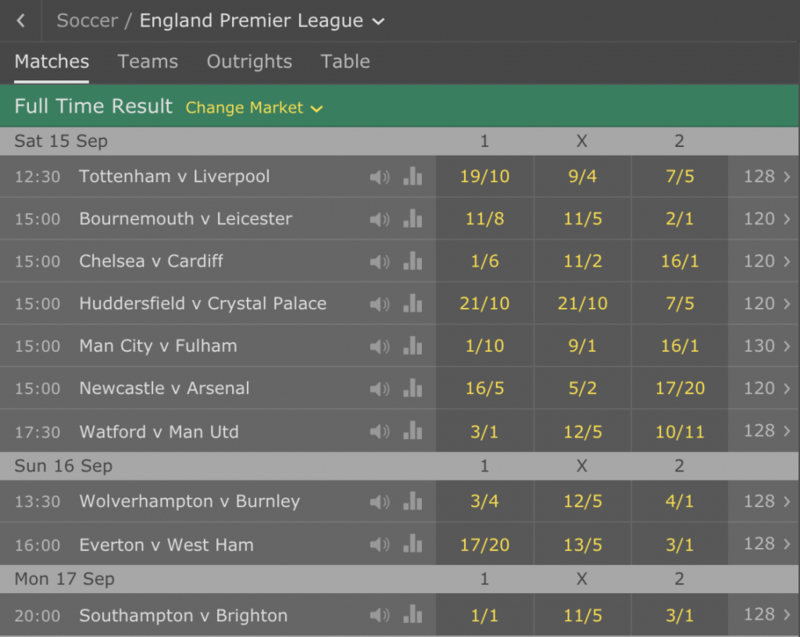 Outlined below are the odds available with bet365 Sport on the Full Time Result market for this weekend’s ten Premier League games. Here’s our tips for each of the games taking place this weekend. If you wanted to place a tenfold accumulator bet on these selections, then bet365, at the current odds shown in the screenshot, would offer odds of 1171.03/1 on those ten selections. That means a £10 bet would return £11,710.30 for a successful bet and you would also get your £10 stake money back too. Both the games between the teams last season produced plenty of goals, Spurs winning 4-1 at Wembley thanks to some woeful Liverpool defending, while at Anfield, the game finished 2-2 in the most dramatic fashion with two injury time goals and two penalties, one converted for Spurs and one prior to that missed. Historically, this game usually sees both teams find the net and given the attacks on display, I think that is a likely scenario here. Add to that Liverpool’s much improved squad and especially their defence and I think pairing that with the draw makes for a great value 3/1 bet. The Gunners have a generally good record against Newcastle, although they did lose at St James’ Park last season. Newcastle are yet to win a home game, losing 2-1 to both Spurs and Chelsea and in truth I can see a similar scoreline here. Arsenal’s defence has been shocking at times this season and they won’t have had much time to improve things over the international break. Newcastle struggle for goals, but I can see them scoring once, but Arsenal’s attack is so pacy and bright that I feel they are capable of getting the two they need to secure a win. While I do like the attacking style Fulham offer, there is no doubt that at the moment, their hastily put together squad from the end of season period is still bedding in and that is causing some major defensive headaches. The one team that are capable of taking full advantage of that with the attacking players they possess is Manchester City, so playing them after an international break is probably the worst time for Fulham. I really feel City will score a fair few goals here and as such, I think having them at -3.0 goals, meaning they need to win by four or more, is a decent bet. Watford may have defeated Spurs at home last time out and I don’t take that result as a fluke as the Hornets have beaten some quality teams at Vicarage Road in recent times. However, I think United as a team match up much better than Spurs do against Watford’s strengths, particularly their physicality and threat at set plays. Add to that United’s off-the-cuff players like Sanchez and Pogba and I think this is a United team that can add to their impressive run of 14 win from their last 15 games against Watford here. Previous: Who Are The Top Picks on the NFL’s Opening Weekend? Next: Who Wins The Big Heavyweight Title Clash Between Joshua & Povetkin?